Sydney hopes that guys in college won't be as immature as they are in high school. I like Friday nights. Not because it’s the start of the weekend but because I get to do whatever I want. I try to get easy homework assignments out of the way then I read fashion blogs or watch YouTube, practice my oboe or eat. Occasionally I hang out with my friends, when we’re not super busy and we can get rides. One thing I don’t do on Friday nights is plan anything special with a guy. Seeing my friends get so caught up with wondering what they should say to their boyfriends to keep them happy, makes me happy I’m single. When they’re constantly asking me what they should do when their boyfriends smile at them or what it means when “he always looks at me when I look at him,” I don’t know what to say. One of my friends had a boyfriend who made her feel as if she didn’t love him enough. She wanted to make school her priority while dating him. So in response he would take her aside every few weeks and complain that he didn’t feel like she loved him anymore. He then would keep asking her if she still loved him for the entire lunch period. She even felt like she had to come up with a creative way to ask him to the Sadie Hawkins dance (a dance where the girl asks the guy) because he asked her to homecoming and prom with notes inside moon cakes (a Chinese dessert). If two people are dating why are they competing to find cuter ways to ask each other to dances? Sydney had fun hanging out with her other single friends and taking goofy photo at a school dance. During sophomore year, I felt like the conflicted girl in a teen novel. I had feelings for different boys at different times but I would always end up in their “friend zones,” which sucked. I rarely got text messages from boys first and if I did, it was mostly about homework. One guy told me that he liked when I put my bangs down. So I wore them down sometimes just to make him happy. He never asked me out and my bangs kept falling over my eyes and it was annoying to keep pushing them back. I realized I was trying too hard to make someone else like the way I look. I can’t believe I worried over something that small. Some of my girlfriends worry about getting asked to school dances because they think that going stag (a group of friends without dates) looks lame. Wrong. The good part about not getting asked to a dance is that I don’t have to worry about which dress or shoes to wear. I hate dresses. I also have a fear of wearing open-toed shoes because I’m afraid people will step on my feet. I have gone stag to two Sadie Hawkins dances and I have worn shorts or jeans and T-shirts along with a pair of Converse. I felt comfortable and worry-free because I did not have to watch out for my toes. Every year my school has “Hula Hawkins.” I went with a group of three close friends and my mom bought us Hawaiian BBQ for dinner and bought us leis to wear. Because I was in ASB, I had to be there early and so my friends and I were the first ones at the dance. 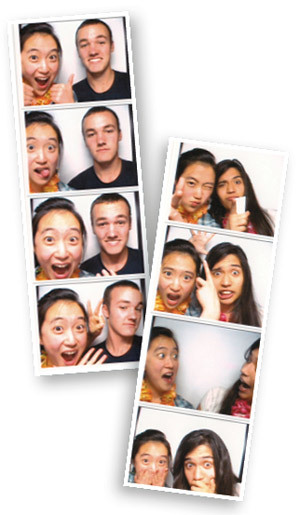 We headed straight for the line-less photobooth. We took pictures again and again and we made the weirdest faces and poses. As a junior last year, I loved the freedom that came with being single. Sometimes I eat an entire Trader Joe’s chocolate bar, while some of my friends who are in relationships are worried about gaining weight and if their boyfriends will notice. I love how I can wear multiple shirts on top of one another and finish it off with a jacket and scarf when it’s cold without worrying whether boys will think it’s cute. This past Valentine’s Day my parents asked me if any guy had given me flowers or a box of chocolates. No. But I wasn’t sad. Instead of celebrating all the couple-love shown by the obnoxious people at my school who were carrying balloons, flowers and boxes of chocolates, I celebrated my best friend’s birthday, which is on Valentine’s Day, and also “Single-Awareness Day,” which I learned about from my other single friends. Although the acronym for that is S.A.D., I felt happy because I rewarded myself with lots of chocolates and sweets. For those in relationships, good, I’m happy for you. But I just wanted to remind other single people like me that it’s not a bad thing to be single and that there are many other single people in the world.